No longer restricted to the rural sector, the agrarian crisis has ‘gone beyond the agrarian’ and is now involving many other parts of society — one significant support group being the student community. Student for Farmers is an emerging faction of the larger Nation for Farmers campaign. 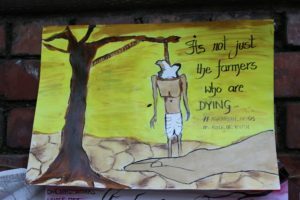 But what connects an average student to the plight of an Indian farmer struggling for justice? “Young people, I think, are more responsive to issues of justice. When something is unfair, the whole unfairness of the situation is particularly striking for them. Later on, people become immune to seeing so much injustice around them, but with young people it’s different. On the 29th and 30th of November, farmers from across the country will march to Delhi to put forth their demand for a 21-day Special Parliamentary Session to discuss the ongoing agrarian crisis. Inspired by the Long Kisan March (Nashik-Mumbai) earlier this year, the Kisan Mukti March is unprecedented — both, in terms of the demands being put forth, as well as the support it is garnering. Consequently, Nation for Farmers — a diverse group of volunteers from across multiple states and sectors — was formed to support the march by mobilizing people across urban and rural areas. One of its emerging factions is the Students for Farmers wing. As two seemingly disconnected social groups, it is worth considering how this student-farmer solidarity is forged. 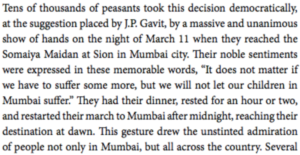 In March this year, the decision of thousands of farmers to march through the night, for the benefit of students in Mumbai, served as an important milestone in building urban middle-class support. “The Long Kisan March was crucial in linking student and farmer issues. 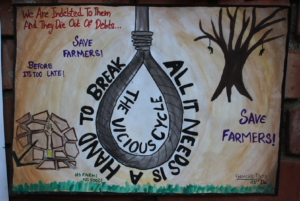 Students for Farmers is an idea to ensure that this linkage is secured and carried forward,” adds Bibin Thomas, a student coordinator and activist for Students for Farmers from TISS Hyderabad. This human angle along coupled with the distinctive democratic demand to be heard in Parliament seems to have successfully captured student imaginations. Nishita,* an M.A scholarship student from Delhi University is from Vidarbha (Maharashtra), which continues to witness soaring farmer suicides rates. Rural India’s many untold stories, like Nishita’s, remind us that the gap isn’t all that obvious for struggling students from rural farming communities. This is very much their fight as well. “We’ve done studies of the families where farmers have committed suicide, one of the problems we’ve observed is when the farmer’s family is in deep debt, the first point of pressure is the young people in the family and whether they will continue their education. Most often, the girls are forced to drop out first because of the existing bias,” says Kiran Vissa. This sense of empathy can be partly attributed to the public education system set-up. The affordability of quality education at public institutions stimulates distinctly diverse student bodies. 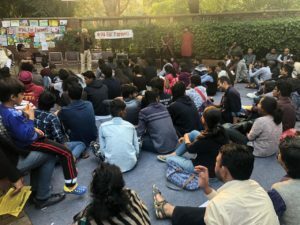 It is only telling that public institutions — Delhi University, JNU, Ambedkar University of Delhi and Jamia Millia Islamia — were the main sites for organisational meetings for students in Delhi. Youth political wings are key mobilizers, having taken on the role of campaigning and generating awareness among peers. With commitment strengthened by political affiliation and ideas, these groups take on the task of recruiting volunteers and other forms of support. Student media also plays a significant role in mobilizing discourse around the issue, most often being independently run on the dedicated voluntary labour of students. Beyond strategic outreach and mobilization, organic concern from within student communities has emerged in colleges across the country. “Students have been taking a lot of initiative themselves. 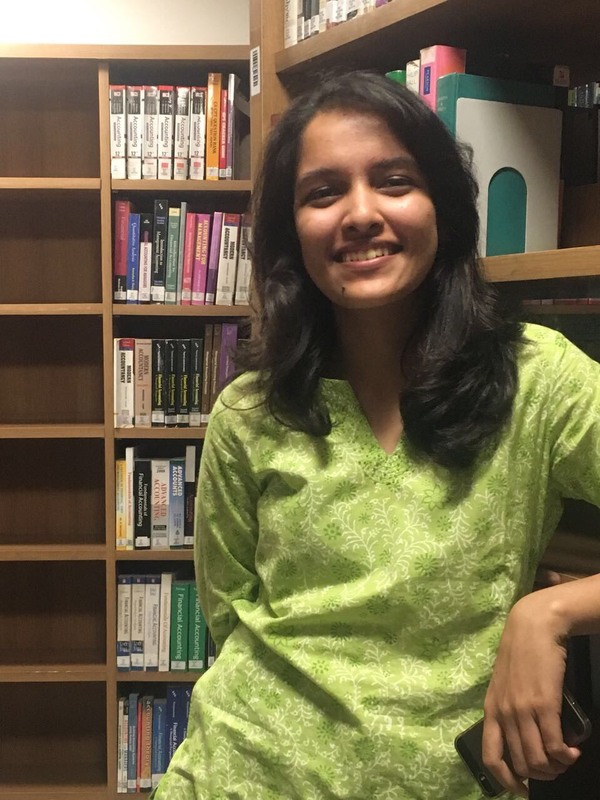 Whether it’s with running the website, or sending in content to put up, the student volunteers have been a real backbone and that helps organizers believe that something of this scale can be pulled off,” says Janhavi Mittal, co-ordinator for Nation for Farmers. Academic research in rural India is also growing as a result of this youth engagement. 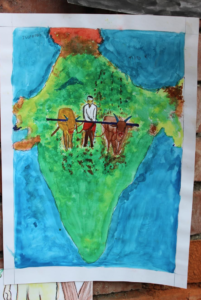 For instance, a number of students at TISS Hyderabad have been formally working with farmer organizations and have now gotten involved with the Nation for Farmers effort. At a fundamental level, this is reflective of a deeper involvement of students in agrarian issues. But what lies beyond the Kisan Mukti March? Does the solidarity nurtured stop at organizing a protest march and volunteering on the ground? Why has this movement been so successful? Student politics and activism in India has famously reached new lows in recent times, distancing many from their ideological antics. Letting ideological politics induce passivity amongst student bodies is detrimental to the health of India’s democracy. The success of this Kisan Mukti March lies in its ability to distance itself from these contentious ideological categories. Those who are marching with the farmers on the 30th of November are normal Indians marching for fellow citizens whose social realities have been irrevocably damaged by the State. A movement with hints of the solidarity envisioned by the country’s forefathers many years ago, the March marks a step forward in rebuilding public democratic participation in India. Albeit in select pockets around India, this is an instance where social inequality has been recognized as a cause worth rallying around by a wider citizenry. 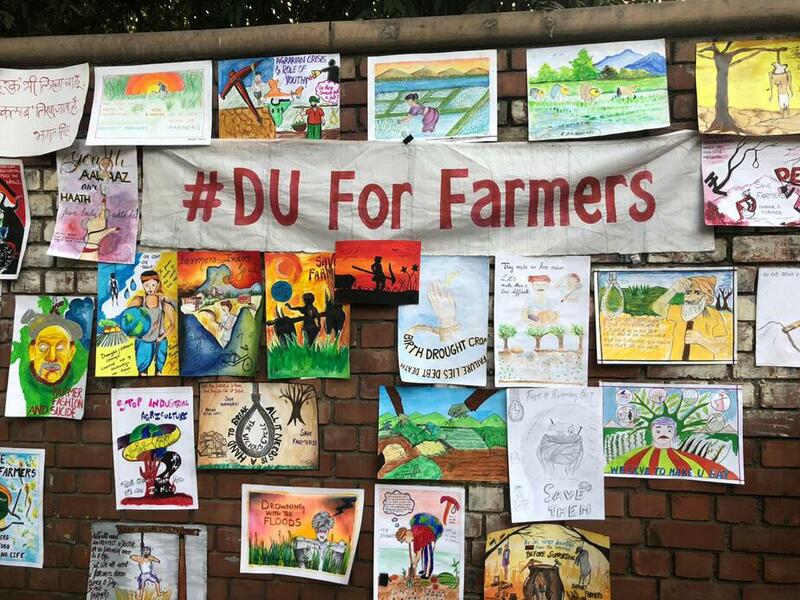 Central to forging any such connection in solidarity is the return of active engagement with agrarian issues in university spaces. When agrarian movements and the issues of farmers become topics of discussion on our campuses, only then are can we say that India’s youth is taking a real step towards changing a larger social consciousness. Next articleThe Letter of the Law: For the People and Of the People?